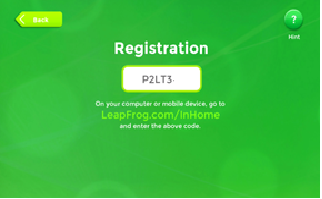 This code is used to link your new LeapTV with your LeapFrog parent account email address. This will allow you to purchase and download apps in the future and receive performance updates as they become available. Enter the code from our TV screen into the box on the website. If you already have a LeapFrog parent account from a previous LeapFrog product, sign in using your email address and existing password. If you do not have an existing account, click on "Create Account" and follow the on screen prompts to set up a new account. As soon as you complete this brief process, your LeapTV will be registered and ready to play!